Hampshire foodies, here’s an event you won’t want to miss – the Thyme & Tides Food Festival at Stockbridge Town Hall, Saturday 18th April. For anyone who hasn’t been, Thyme & Tides is a lovely deli, bistro and fishmonger in Stockbridge. 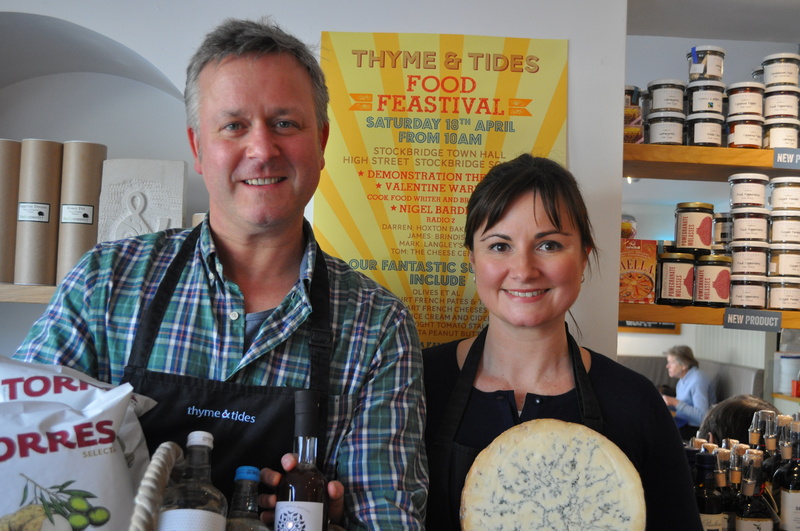 The food festival is in celebration of Thyme & Tides’ fifth birthday and will feature special guest appearances from BBC’s Nigel Barden and Valentine Warner as well as demonstrations from foodie experts showcasing their skills with bread-making, gin, wine, cheese and much more. I’m told there will be plenty to try and buy with around 20 of Thyme & Tides top suppliers inviting guest to enjoy their wares! These include Olives et Al, Ballancourt French pates and terrines, Hennart French cheeses , Purbeck Ice cream and ciders, Isle of Wight Tomato Stall and Utta Nutta Peanut Butter and more. Upstairs I’m told there will be a demonstration theatre where you can hear from Valentine Warner and Nigel Barden, BBC Radio 2’s food and drink critic and broadcaster. They will be joined by Darren Bland of Hoxton Bake House, James Robinson of Spanish food experts Brindisa, Mark Dawson of Langley’s Gin and Tom Badcock of The Cheese Cellar. Best of all, entrance to the main event is free and tickets for the food demonstrations are just £2.50 for adults, kids go free. A proportion of all ticket sales will be donated to the Alex Lewis Trust too. Sounds like a fab foodie day out to me! Doors open at 10am, until 5pm. The event, which is supported by Hildon Water, will take place at Stockbridge Town Hall, High Street, Stockbridge SO20 6HE. You can find out more at: www.thymeandtidesdeli.co.uk, call 01264 810101 or join me and follow the event on twitter @foodfeaststockb.